till the cuckoo stole his eggs away to Galilee. 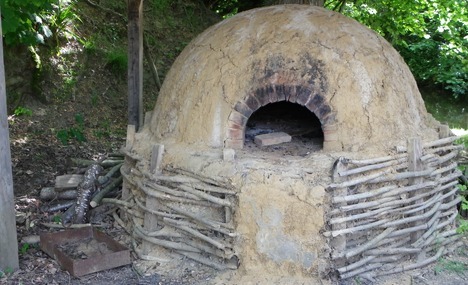 Will the bread inside this oven ever rise? we fed each other roe paste till the cod was gone. I’d hoped the stork would help me scrub the chimney. no salty little pieces left to nibble on. But he flew to Santiago for the Holy See. it’s time to light fresh coals beneath a different song. The cossante is a Galician-Portuguese folk poetry form made popular in the 12th-14th centuries. Sung initially by women, it contains a weaving pattern known as leixa-pren, a dance term for two alternating lines of dancers and singers. With the rise of troubadours and jongleurs, the humble cossante found its way to royal courts where it became more formalized; but even when sung by men, they often retained the female narration. The oldest known fragments of folk poetry come from 10th century Aquitaine and may have been fertility chants, a theme I’ve scooped happily for this piece. Yep, as in Mary Poppins…and you gotta ride the first syllable of Galilee, else trip on your clogs. Thank you, Once! I appreciate your reading and your kind comment.